You’ve probably heard of the no poo method by now. After all, it is all over the internet. What is this theory all about? According to the theory, washing your hair with a baking soda shampoo, or some other gentle alternative to shampoo, you achieve clean hair without the damage of harsh chemicals in commercial products. In other words, you do not allow chemicals in shampoo to strip your hair of natural oils. Instead, you strip away chemicals and give your hair a clean and healthy rinse. Now, it is only logical to be skeptical about such a method. After all, most of us believe that our daily shampoo ritual is vital to keeping our hair healthy and clean. But just take a quick look at the ingredients list of your shampoo. See how many chemicals, dyes, fragrances, and so on are in there. Your hair has natural producing oils. Over-washing with shampoo can strip the hair of its natural oils, and encourage your scalp to produce an excessive amount of oil. The result is greasy hair, dandruff, and similar hair issues. The no-poo method, or the baking soda shampoo sounds simple in theory. You combine one part of baking soda and three parts of water, apply at the roots, wait for a few minutes, and rinse with warm water. But as easy as the method sounds, there are a few other tips you can use to achieve maximum efficiency. People always start small, and then go from there. And while that works in most cases, it is not as good in this one. Instead of preparing the solution every time you step in the shower, you can prepare a large bottle, and keep it at arm’s reach. Why mix something when you are standing in the shower soaking wet? What you can do is prepare a large bottle, by using the 1:3 ratio. Keep the squeeze bottle in your shower, and get it anytime you need it. The no-poo method means you are using only water and baking soda for your shampoo. But that doesn’t have to be the case always. If you want your hair to smell beautiful after washing, you need some other ingredients. Let’s start with castor oil. In addition to giving your hair some scent, castor oil promotes healthy growth and improves the thickness of your hair. You can also try some peppermint or lavender essential oil as well. Add 10 to 15 drops of castor oil or essential oils to your large squeeze bottle batch. After washing your hair, you will come out of the shower smelling super fresh. Fair warning: putting castor oil or essential oils might tingle on your scalp at the beginning, but that is only a natural reaction. If there is excessive stinging, however, avoid oils. There is no reason why your simple shampoo cannot do more. For example, if you are battling dandruff, you can easily turn your baking soda and water shampoo into an anti-dandruff solution. Just add lemon juice, an ingredient known for reducing white flakes. Just several drops are more than enough. Wash as you normally do. After washing and applying shampoo, the logical step in the hair care routine is applying conditioner. Well, for the no-poo method, that means using apple cider vinegar as a rinse. For this rinse, you need to mix 1 part of apple cider vinegar, and 4 parts of water. Pick any essential oil you like, add few drops to the mix, and that is it. Same as the baking soda shampoo, make it in bulk and place in another squeeze bottle. Rinse off the baking soda, apply ACV conditioner, and then rinse with cold water. The conditioner will help you add some moisture and shine to your hair, all while preventing frizz. The one downside of using baking soda on hair is that baking soda tends to clump pretty easily. For those with thick hair, that means you need more attention to rinsing. For the second rinse, you can even toss your head upside down to ensure you clean parts you’ve missed the first time. You do not want any baking soda residue in your scalp. That can only encourage more oil production. 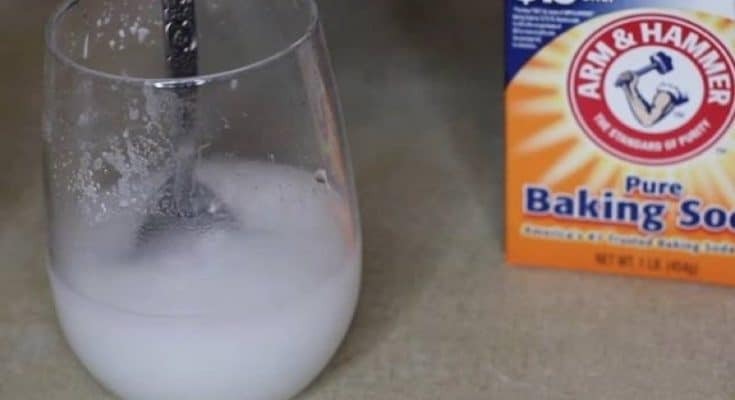 Baking soda can be used as a regular shampoo, and as a dry shampoo as well. If you do not have much time for the whole washing and then drying process, try baking soda dry shampoo. When you are in a hurry, just sprinkle some baking soda onto your roots. Flip your hair upside after, and tousle it all in. This is way cheaper than purchasing expensive commercial dry shampoo products. Generally speaking, the baking soda alternative is safe. But it is also abrasive, and can leave your scalp dry. With that in mind, there are situations when you should stick to regular shampoo, and avoid putting baking soda on your scalp. As with every DIY method, there are people who believe in it, and people who think it is all a myth. With that in mind, we want to debunk a couple of myths about the no-poo method. This is the bottle line. At the end of the day, we all want to know whether a new method is safe for trying or not. Baking soda can pose some risks, and we mentioned previously when you should not use the no poo method. Generally speaking, there is no scientific research that proves the no poo strategy and theory. At the end of the day, it is all about believing in people that have tried it. But it does not hurt to try something new, does it?